Jacques Audiard stunned audiences worldwide with his visceral crime drama 'A Prophet' in 2010, the follow-up to the similarly acclaimed 'The Beat That My Heart Skipped'. The French director's latest effort is a reaction to the intensity of his last film, opting for a love story, which deservedly won the Best Film Award at the 2012 London Film Festival. Matthias Schoenaerts ('Bullhead') is Ali, who starts the film as an unemployed single father forced to move to the south of France with his young son. They live with his sister and her husband, and Ali gets a job as a local nightclub bouncer, where he meets Stéphanie (Marion Cotillard, 'The Dark Knight Rises', 'Inception'). Soon after, Stéphanie suffers a life changing accident while working as an orca-whale trainer. The relationship between the two forms slowly, Ali typically and quite openly more concerned with his next sexual encounter than Stéphanie, or his son, for that matter. Somewhat unwittingly however, Ali aids Stéphanie's recovery and outlook, while Stéphanie finds new purpose as part of Ali's burgeoning bareknuckle fighting career. 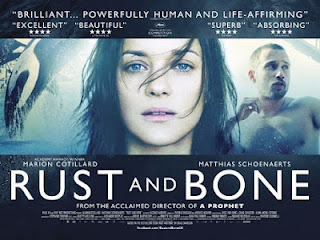 'Rust And Bone' is brutal, both from an emotional perspective but also in a very physical sense on-screen - not just in terms of the boxing scenes either - a scene where Ali's son is accidently hurt drew an audible gasp from the viewing audience. It is the performances of Cotillard and Schoenaerts however that are most arresting. Cotillard's work as the disabled Stéphanie is mesmerising - the scene where she discovers her disability as powerful as anything seen in cinema this year. Schoenaerts similarly succeeds in an arguably meatier role, exploring a conflict between Ali's physical presence, his desires and his unpredictable relationships with his family and Stéphanie. The stark cinematography of 'Rust And Bone' is often breathtaking, and the incredible visual effects used to portray Stéphanie's disability are utterly convincing. Yet it is the characters themselves, and the journey they go on, that hold our attention. Jacques Audiard's latest melodrama is supremely affecting, always engrossing, thanks in large part to the central performances from Marion Cotillard and Matthias Schoenaerts. 'Rust And Bone' is released in UK cinemas today, through STUDIOCANAL UK.